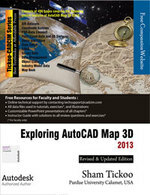 Exploring AutoCAD Map 3D 2013 textbook introduces the users to the powerful Geographic Information (GIS) tool, AutoCAD Map 3D. Built on the latest release of AutoCAD software, it has various tools that help you create, update, and analyze geospatial datasets for use in field of infrastructure design, layout planning, and spatial analysis. This textbook has been written considering the needs of the users who wish to learn, explore, and develop their skills in using AutoCAD Map 3D in their respective domains. This textbook covers the basic as well as advanced GIS procedures in AutoCAD Map 3D through comprehensive text and graphics, and caters to the needs of both the novice and advanced users. The author has covered a range of topics such as creating and assigning coordinate system, drawing object and feature object, using FDO data connection, working with object data and database, data store, data query, attaching external drawing and images, and Industry Model Data. Moreover, this book also emphasizes on the concepts of spatial data analysis and output generation using the paper and electronic media. The chapters in this textbook are structured in a pedagogical sequence that makes this textbook very effective in learning the features and capabilities of the software. Each concept has been thoroughly explained through text, practical examples, and data-flow diagrams. In addition, the tutorials, exercises, self-evaluation test, and review questions are provided at the end of the chapter to practice and test your AutoCAD Map 3D skills. Written with the tutorial point of view and the learn-by-doing theme, the textbook is ideally suited for learning the software at your convenience and pace.